In my last column, which appeared right before Mitt Romney cruised to an easy victory in the New Hampshire primary, I rather confidently predicted that the GOP's political clown show was just about over and that the ever-flexible former Massachusetts governor was a lock for the nomination. In the wake of former House Speaker Newt Gingrich's easy win in Saturday's South Carolina primary, it's clear that I and many other pundits underestimated the deep-seated revulsion that many in the Republican grass roots feel toward Romney. It's easy to see why they feel this way. Here is a fat cat so wealthy and tone-deaf on the stump that he practically personifies the high-handed arrogance of the top 1 percent. He actually seems to think he can get the support of hard-pressed working people by dismissing the $374,324 he earned in speaking fees as "not much." After five years of campaigning nonstop for the presidency, he still hasn't figured out how to handle utterly predictable questions about his tax returns and his record as a swashbuckling venture capitalist. His ineptness is startling. The simple fact is that for all of his flexibility on the issues, Romney is a stiff campaigner, who looks as if he belongs on Mount Rushmore but acts as if he's actually carved there. He does brilliantly when he sticks to the scripts that his high-priced speechwriters produce, but he fumbles when he is forced to extemporize. He can't seem to think on his feet. He is, in other words, the perfect foil for a mudslinging, unprincipled, opportunistic, bloviating egomaniac such as Gingrich, whose new nickname could easily be "the Sleazy Warrior." Gingrich is the kind of guy who, back in elementary school, would have shaken down Romney for his lunch money. And they were right. The centerpiece: "King of Bain: When Mitt Romney Came to Town," a lurid, 28-minute-long quasi-documentary about all the devastation and cruelty Romney supposedly inflicted on small-town Americans during his days as head of Bain Capital, a private-equity firm. Once Winning Our Future posted it on the Internet, poor Mitt was on the defensive. It didn't matter that the video was so full of errors and distortions that the Washington Post's Fact Checker column gave it four Pinocchios, its highest award for deception and plain old lying. That's just the sort of negative campaigning that Gingrich had claimed to forswear — but hey, politics ain't beanbag. By the time Gingrich got around to blandly asking his supporters to either correct the errors or take the thing down, Romney was practically channeling Gordon Gekko's famous quip, "Greed is good," anyway. Poor Mitt even did it again in his concession speech on Saturday night, forming his lips to claim that, "When my opponents attack success and free enterprise, they are not only attacking me, they are attacking every person who dreams of a better future. He's attacking you." Romney's remark was supposed to deflect Gingrich's attacks, but unless his audience was stacked with coupon-clipping multimillionaires with secret accounts stashed in the Cayman Islands, it's hard to say who he was talking to. While reveling in Romney's self-destruction, Gingrich reached into the old Republican kit bag of dirty tricks. Sounding a lot like Ronald Reagan ranting about welfare queens, he doubled down on his characterization of Barack Obama as "the best food stamp president" in history. This follows on the heels of his gratuitous offer to lecture the NAACP on why black folks need jobs instead of government assistance. Having cut his political eyeteeth in neighboring Georgia, Gingrich knows that old-fashioned race-baiting like that still works with white voters in South Carolina. 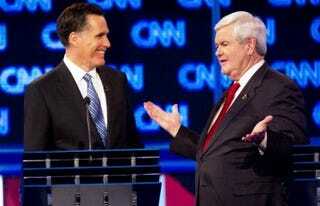 And to give the big, fat devil his due, Gingrich proved to be a master debater. When, in the last showdown before the voting in South Carolina, moderator John King asked him about ex-Mrs. Gingrich Number Two's allegation that he had tried to seduce her into an open marriage, Gingrich adroitly used his reply to launch an assault on the liberal media for its "despicable" habit of protecting Obama. Watching a serial philanderer like Gingrich summon up all that phony umbrage and moral outrage was great political theater. It was a feat of verbal jujitsu that poor Mitt could never manage. So now Romney faces a long, hard slog to defeat Gingrich for the nomination, starting on Jan. 31 with the Florida primary. I still think ultimately poor Mitt is going to prevail because he has the most money, the largest and best-organized campaign and the support of what passes for the Republican establishment these days. Those power brokers are not going to let a buffoon like Gingrich (who, as a Romney TV spot claims, "has more baggage than the airlines") be their standard-bearer if they can help it. A lot of them really hate him. Yet Romney's inability to wrap the thing up quickly has got to be worrying his party's pooh-bahs. The longer this bitter race to the bottom goes on, the more extreme and ridiculous the GOP seems to be. So I take back what I said in that earlier column. The clown show is still going on.